Vinyl liner swimming pools most commonly are built using galvanized steel wall panels. While some pool kits use a polymer plastic wall kit, the vast majority installed currently in North America use the steel wall design. For the most part the steel walls of your pool will last forever. In over 25 years of building and renovating vinyl liner pools, I have only encountered wall panels so rusted that they needed to be replaced perhaps once or twice...very uncommon. While the walls in a vinyl liner pool may rust, in almost all cases this level of rust is not enough to structurally compromise the wall itself. The main concern is that the corrosion developing on the wall can be sharp and can be a hazard for your liner. Bonding & galvanic corrosion - Swimming pools need to be bonded to make them safe for swimmers to use, but also to protect the pool itself from damage. Specifically, when you add dissimilar metals to a body of salt water, then you will develop galvanic activity which will result in the advanced corrosion of certain surfaces. Since all swimming pools use salt, in the form of chlorine, or more recently in the form of a salt water chlorinator, then any steel wall vinyl liner pool is at risk of damage from galvanic corrosion. The way to avoid these problems is to be sure that your pool is properly bonded and grounded, as well as adding a sacrificial anode to the plumbing installation. By bonding your pool (and specifically the wall panels) you will prevent the walls from advanced rates of decay. The higher the salt level in your pool, the greater the risk for galvanic corrosion, so having a salt system will increase the risk, and rate of damage, from galvanic corrosion. If you want to learn more about galvanic corrosion then you can read this article about salt water in swimming pools. Leaks in the pool - Under normal operating conditions the steel walls in your vinyl pool are not in direct contact with the chlorinated water in the pool. Under these conditions the wall panels will almost never rust and certainly would not fail structurally. The problem with rust developing on the pool walls usually starts with a leak in the pool that allows the chlorinated water to touch the wall panels directly. This will allow chlorinated water to promote rust on the walls as well as allow the wall panels to become part of the galvanic couple of the pool system. Even with a sacrificial anode installed in the pump room you can still experience localized anodization which will result in advanced corrosion development. Leaks in a swimming pool cause much more damage than just additional water, heating and chemical bills. Leaks in swimming pools that are left unattended for extended periods of time can cause massive rusting issues to the pool walls. So why would anyone leave their pool leaking for so long? It is not always obvious that there is a serious problem. Some swimming pools that leak will lose water steadily. These are the easiest to find. Some swimming pools will lose water quickly, but then the rate of water loss will slow down or stop as the area the pool is installed becomes completely saturated with water. Essentially your pool is then sitting installed in a bathtub with chlorinated water on both sides of the walls. These are the pools that will have extensive problems with rust on the walls and serious remediation efforts will be needed before you will be able to hang a liner again in the pool. 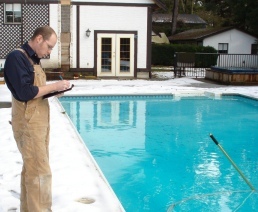 If you think that you might have a leak in your pool then you might benefit from reading this article that talks about how to find a leak in a swimming pool. When there is a breakdown of the pool system itself, steel walls in a vinyl pool will be exposed to conditions that they were never intended to endure. This is where you can develop serious issues with rust developing on the walls. Galvanized steel walls are resistant to corrosion under normal operating conditions but chlorinated water and galvanic corrosion can most certainly damage the walls. Fortunately, even when it is discovered that there is extensive rusting on the walls, it would be very uncommon to encounter rust that compromises the structural integrity of the pool. In almost every case you will be able to remediate the walls without needing to replace panels - which means that you don't need to take the deck out or dig up the pool with heavy equipment. Fixing the walls is not exactly going to be a fun process, but it can be done. Once you have identified that there is rust on the walls of your pool you are usually on a ticking clock. Most of the time the severity of the problem will go unnoticed right up until you start removing the old liner. At this point, the idea is to have your pool drained and empty for as short of a period of time as possible. If you have extensive rusting on your walls then you must stop all work and address this before you can proceed. For a pool company this might amount to a phone call and a trip back to the shop to pick up the gear for repairing this. For a pool owner, seeing rust covering every square inch of your pool walls can be alarming. Empty vinyl liner pools tend to look pretty ugly. Experienced technicians get desensitized to this, but if you don't see many empty pools you might even assume that your pool is completely broken. Grinding and painting pool walls qualifies as one of my least favorite projects to do, but with some hard work and a few specific tools you should be able to get your walls back into serviceable condition. They might not be perfect, and if you have heavy pitted rust then you will almost certainly be able to feel the texture through the walls. You should, however, be able to slow or stop the corrosion growth and soften the wall enough that your new liner is not in jeopardy. The first step to remediating rusty walls is you need to remove as much of the rust as possible. Right now the rust is growing, and sharp, and you need to go over every inch of the walls and remove as much of the rust as you can. The more bare steel you can expose the better. You will simply not be able to remove 100% of the rust, but just be thorough and take your time with this process as you will have to live with the results for the life of your new liner. Using grinding disks with a backing pad on an angle grinder is the best method to get the rust off, but be warned, using an angle grinder like this is dangerous, hazardous and very hard work. I prefer the smaller 4" series of grinders I can hold with one hand as opposed to the larger two hand models. Unless your pool is extremely shallow you will end up having to hang down over the edge of the pool to reach some areas. I much prefer to have at least one hand free. There is no safety measure too aggressive for doing this kind of work. Ventilator, glasses, face shied, protective clothing and heavy gloves are the minimum protection you should have for this task. Once you have removed all of the rust that you can off of the walls you can wash them down thoroughly. I like to wash them down when the walls will still get a lot of direct heat and sunlight to help dry up all of the water as quickly as possible. Once the walls have been prepped, and are completely dry, you can proceed to repainting them. Unfortunately regular paint will not work. In fact almost every kind of paint that you might have, or choose for this process, will not be the correct stuff. That is because the product you need is not technically paint. You need cold galvanizing compound. When you grind down the walls of your pool you are removing the rust but also the zinc layer that is supposed to inhibit rust. If you were to slap some regular paint on the walls, they would begin to rust at an even faster rate and you can almost count on your liner failing early. Heavily rusted walls in a vinyl pool is a serious problem, and not one to cheap out on where there is a reasonably priced solution. You can buy aerosol cold galvanizing sprays however if you have rust on all of your pool walls you should use a roll on application that will give you a better result. This cold galvanizing compound will apply at between 200 to 400 sf per gallon, so you would need between one to two gallons depending on the size of your pool and the severity of the pitting of the surface of the walls. Do not try to use the spray version of the cold galvanizing spray unless your rusting issue is very minor and you have no pitting of the wall at all. The grinding disks will wear out very quickly when you grind so you will need a big stack of them to grind down all of your pool walls. The rougher the surface the more cold galvanizing compound you will need. So long as you do not skimp out on either of these steps then you should be able to restore the walls of your pool to a useable state. After the galvanizing has cured completely be sure to inspect the walls again to make sure that you did not miss any areas that will be sharp and damage the liner. I usually scrape the walls with a hand held wall scraper or putty knife to help identify any problem areas. Of course if there was a leak, or a lack of bonding in your pool that caused the extensive rusting problem, you will want to be absolutely certain that this problem has been resolved before installing a new liner your pool. You certainly do not want to have the rusting continue once the new liner is in the pool. If you have a leak you can read this extensive article on pool leak detection, or if you need more information about how to prepare your pool for a new liner installation you can read this extensive article on how to install a pool liner.